Over the river village the moon is setting: it is time to sleep. It will remain among the flowers of the reeds, by the shallow waters. Some readers may notice that the poem is transcribed in simplified characters. 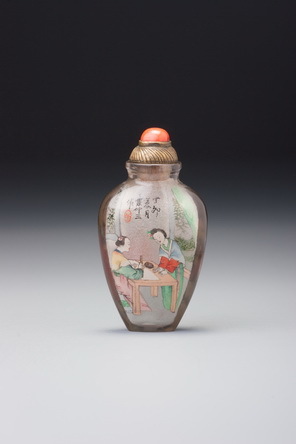 However, this does not mean the bottle was painted after these became the official forms in mainland China in several rounds in the 1950s and 1960s! All of the characters are attested in pre-modern texts, usually as ‘vulgar’ (cf. vulgate) variants. For the tiny space within a snuff bottle, they have obvious advantages. The painting is in remarkably good condition, with all of the original colours still visible and the subtlety of the washes and brushwork plain to read. It is a strange departure from Gan’s usual practice insofar as it has no signature or seals. Even his unsigned works normally have at least token seals, whereas here there is nothing. He has absorbed himself in the personality of Sikong Shu. He has become his image, so no signature is necessary. To learn the name of the artist, step into the picture and ask the man in the boat.